My name is Owen and I'm a programmer and creator from Canada. I usually make games, the majority of which you can find on my company's website. This page was built to showcase other projects I've worked on that don't fit under the Fire Face Corporation banner. An overview of the different methods used to create my eye shader. A detailed technical breakdown of how I achieved the water effect in the latest iteration of my engine. In December 2016 I wanted to experiment with working on a VR project. I spent a few days integrating OpenVR into my engine and spent 30 days prototyping and documenting my short VR project. Every day I wrote a post about my progress with an accompanying video and current build. You can see the first post here and watch a playlist of all the videos here. Dirty Rectangles is an Ottawa based organization focused on bringing together a community of local game creators to boost their voices and showcase the things they are building. The main focus is a free monthly meetup in downtown Ottawa where anyone can show up and showcase whatever they want to, be it a commercially focused game in development or a weird weekend experiment that went horribly wrong. I worked as an organizer for 5 years before stepping down to focus on my development work. In that time we worked to grow the local community and bring together creators, as well as take part in other local events and represent the Ottawa game development scene at other gatherings around the country. Dirty Rectangles meetups happen every third Wednesday of the month at the Avant-Garde Bar in downtown Ottawa. During the development of Small Radios Big Televisions I began creating gifs of the different game elements I was working on. This soon became the main promotional avenue for the game and turned into an entirely new creative area for me. These days I use gifs to showcase game development tools I'm working on, new game features, or just interesting art and effects. They are all captured in real-time from my engine using custom in-game tools. I've posted a few of my favorites below, but you can view all my recent gifs here. 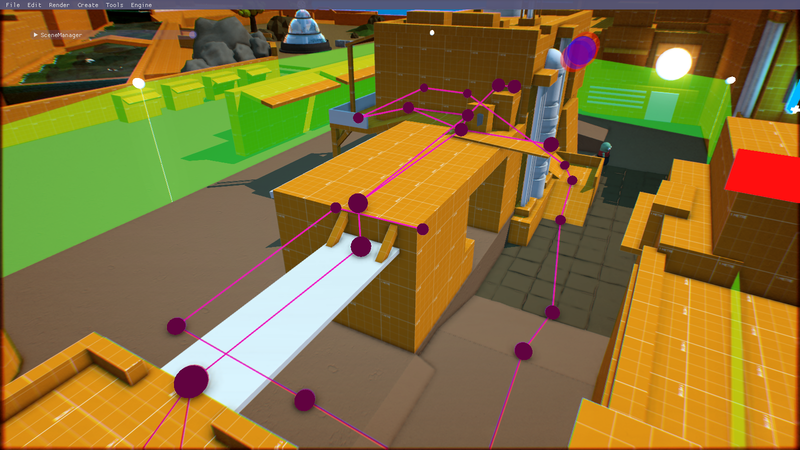 One of my favorite parts of game development is engine work. Most developers these days use pre-built engines but I really enjoy the learning and creative fulfillment I get out of building a game from the ground up. The first shipped engine I created, for Small Radios Big Televisions, was highly specific with very little re-usable code. My current iteration was designed to be modular and extendable, with a focus on tools development and the ability to quickly prototype different ideas. These engines are not designed to measure up to Unity or Unreal, but more a way for me to build an environment where I can create the games I want in the way that perfectly suits me while improving my engineering skills.